Intrigued by the notion of a 42-year-old wine that was "still backwards," I checked with two sources far more knowledgeable than I am about old Bordeaux. I have to say that for most wine drinkers a 1970 Latour, even in magnum, could hardly be called backwards. It's 42 years old! It may be hard, unyielding, tannic, even impenetrable. But how much longer should anyone wait? My advice: drink these wines as soon as possible. The next day I was invited to taste some library selections at Seven Hills winery in Walla Walla. In preparation for an upcoming dinner, Cabernets from 1998, 1995, 1993, 1992 and 1990 (a reserve) had been opened, along with a 1999 reserve Merlot. All the wines had been stored since bottling at the winery, always a plus, but some were definitely showing their age. I don’t know of any wines from anywhere in Washington (or Oregon or California for that matter) that actually improve for 30 or more years, though some may prevail. There’s a big difference. The optimum window for drinking most Washington reds seems to be between 8 and 12 years of age, unless you are really drawn to faded fruit. Among the Seven Hills wines, the 1999 Merlot was exceptional, with mature fruit, tobacco, a whiff of funk and a bit of cinnamon. The 1993 Cabernet, just 12% alcohol, was surprising – high in acid, with a mix of herbs and sweet tomato flavors. Certainly ready to drink, but nicely evolved and interesting. Best of show for me was the 1990 Seven Hills Vineyard Reserve Cabernet Sauvignon. The oldest wine, it had more than doubled the decade of aging predicted on the technical sheet, drank like a dream, and might well have another decade of life left in it. There will be no reserve Cabernet from Seven Hills in this vintage and, as is sometimes the case, the regular bottling is all the better for it. Here the addition of fruit from Klipsun, Artz, and other blocks generally used in the Pentad bottling adds heft and depth. Lovely aromas of raspberry and cherry, highlights of basil and other fresh herbs, and bracing natural acidity create a perfect mix of flavors, that remain delicate yet penetrating. Nice post, Paul. At a recent tasting pitting Walla Walla Cabs vs Red Mountain Cabs, the #2 WOTN (besting Col Solare, QCreek Galitzine, Chat. Rollat) was a 2003 Seven Hills Klipsun Cab. I had a 2002 Seven Hills Ciel du Cheval red last year that was mind-blowing. Their wines improve with age as well as if not better than any other WA winery. Thanks Brandon. Sounds like an excellent tasting. 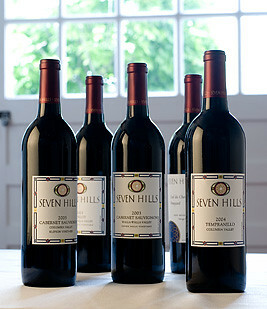 Seven Hills wines tend to be less flashy than many, but beautifully proportioned and proven to age well.